Heey! I am sooo bad at uploading showoffs! Everything happens on Facebook, right? These dreads where actually my own that I had had for several years but decided to sell. So I re-sealed them, made them wavy again and added a few new ones with different colors for a girl in Canada who bought them! I installed them in his hair! You will se on further pictures that there are gaps between the fully dreadded hair. He had extremely thin hair, especially on the top of his head. If I had seen his hair before he ordered the dreads I would have told him to go for many thin instead of just 40 thick. But well well. He is happy and so am I. They are starting to get really pretty! And the gaps are slowly closing in. Tired after the install! Took me 8 hours to do it. Since then I have had two fixups, and here is the one most recently. 55 human hair dread extenders for my hair! After 3 years of wishing I never cut my former dreads off I finally decided to get them back!! Oooooh, your new hairs looks simpley wonderful! I love them all, they're so pretty! I love how natural looking your dreads are, seriously I remember your first sets and its just amazing how far you've come. Stunning work. They look 100% real. 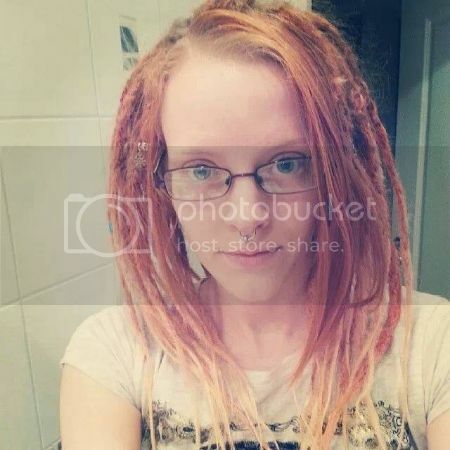 I remember your absolutely lush red real dreads from many years ago! Love the look of the crocheted new ones! Ooooh, the autumn mix from May! Gorgeous!